France is a country that offers visitors incredible diversity. It is loved by so many and is one of the most visited countries in the world. But the majority of those people only visit Paris. This two week France itinerary aims to get you outside of Paris and exploring other equally incredible parts of the country. 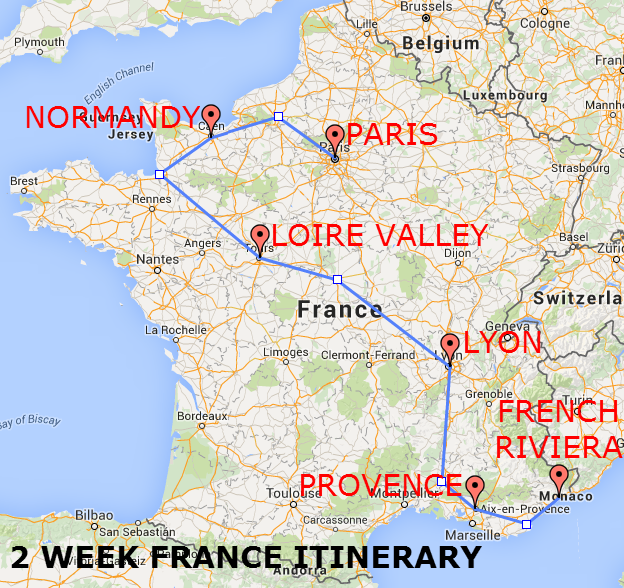 My France two week itinerary covers just about everything that France has to offer. 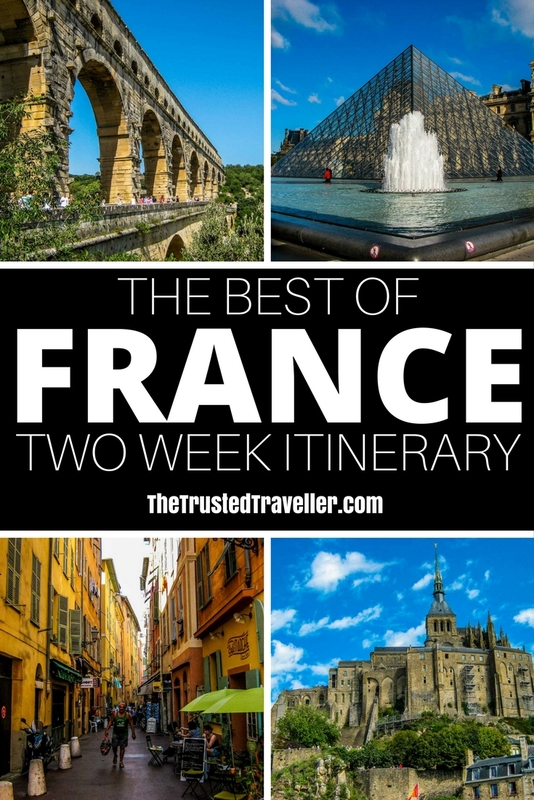 It brings together the best bits of France so you can get a taste for this beautiful country and make the most of your precious vacation time. Day 1 – arrival in Paris. This itinerary assumes that you arrive in the morning giving you three quarters of a day to start seeing the sights. The City of Lights, Paris, is one of the most visited cities in the world and rightly so. It is dripping with amazing architecture, world class art and culture and mouth-watering food. Paris is a city for everyone and its highlights can easily be explored in just a few days. 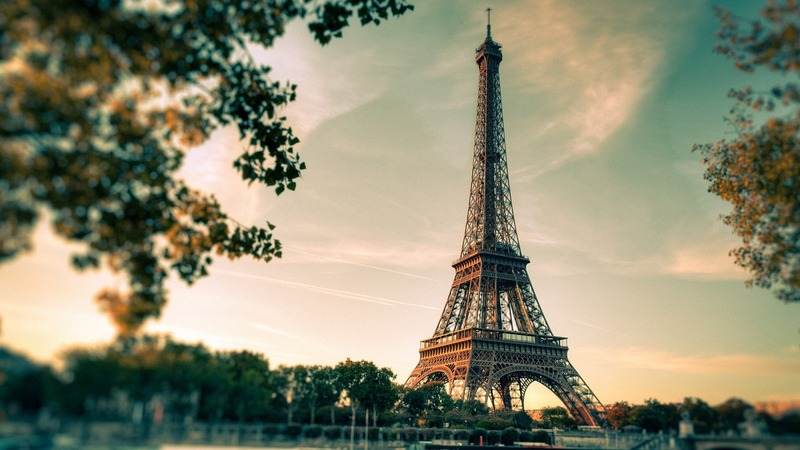 Eiffel Tower – The icon of Paris is the perfect place to start your visit. Admire the architecture of what was once the world’s tallest tower before being whisked to the top in an elevator to enjoy the most spectacular uninterrupted views of the city. 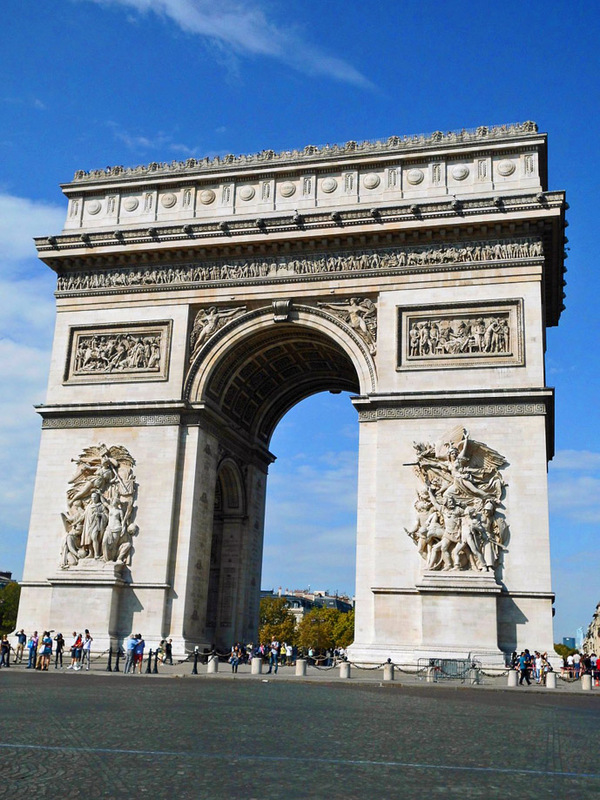 Arc Du Triomphe – Take a walk up the famous Champ Elysees to enjoy the approaching view of this imposing arch. Built to honour those who fought and died for France, check out the inner and outer surfaces of the Arc for the names of French war victories and generals inscribed in the stone. You can climb the steps to the top for nice views over Paris and down the avenues that run off the centre of the Arc. Notre Dame Cathedral – One of the finest examples of French Gothic architecture in the world, Notre Dame is famous for its incredible stained glass windows and for the gargoyles that guard the cathedral from above. Inside it is simply breathtaking and the view from the top allows you to get a closer look at those gargoyles, the cathedral’s roof and spires and over the city. The Louvre – Home of the famous Mona Lisa, the world’s largest and most visited museum is spread across three wings with eight different departments and around 35,000 works of art and artifacts on display. One visit is most certainly not enough to take it all in so a little forward planning about what you want to see is a must. Montmartre & Sacre Coeur – For many hundreds of years the area of Montmartre has attracted artists from around the world. Today the area has a very bohemian vibe with tons of character and notorious nightlife. 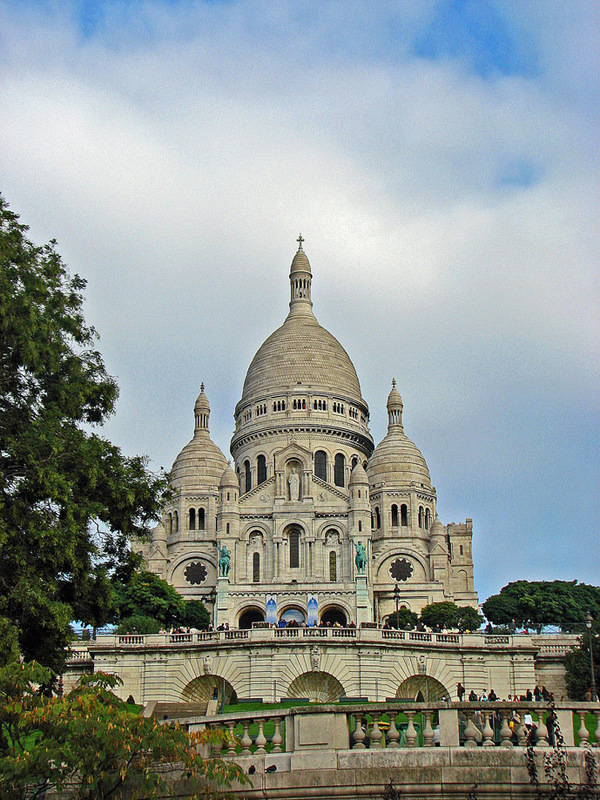 The most notable structure in the area is the lovely Sacre Coeur Basilica which holds services daily for locals and visitors. Make sure you enjoy the view from the area in front of the Basilica looking out over Paris. 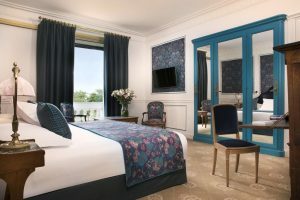 Cruise the Seine – Some of Paris’s best architecture and landmarks line the Seine River making a sightseeing cruise a must do. My top tip is to hop aboard the Bateaux Mouches for a one hour cruise at night on an open top boat that will take you under all of the city’s famous bridges and past its famous sites. 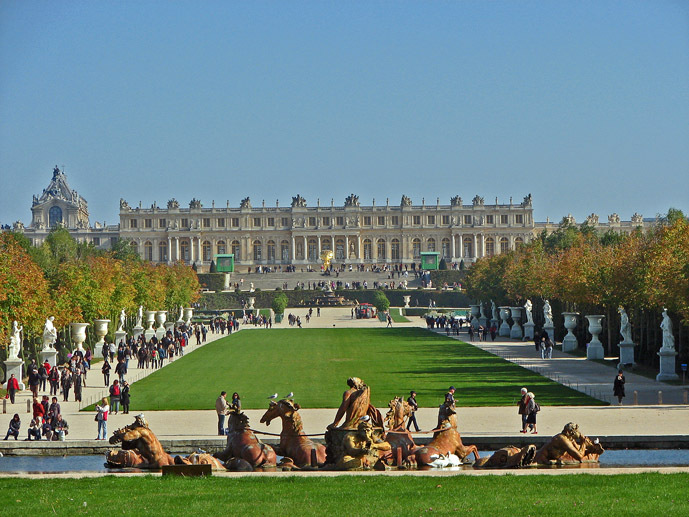 Palace of Versailles – This grand chateau was once home to Louis XVI and Marie Antoinette and is simply spectacular inside and out. 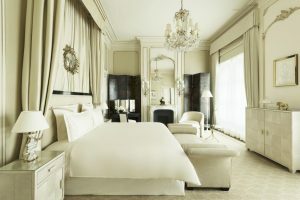 Grand rooms filled with priceless works of art, furniture and antiquities on the inside and sprawling perfectly manicured gardens on the outside make this a worthy half to full day trip from the centre of Paris. Enjoy the Gardens – Paris has some really stunning gardens that are a haven from the busy streets of the city. Stroll the length of the Jardin des Tuileries from the Louvre to the Place de la Concorde or enjoy the spectacular flower displays of the Jardin du Luxembourg, just to name two of the city’s best green spaces. Drive: Paris to Caen – approx. 2.5 hours. Leave Paris early to give yourself plenty of time to stop along the way. Suggested Stop: Like Paris, Rouen is set on the River Seine and has a rich medieval history. In just a few hours you can easily check out the city’s Gothic Cathedral (a favourite subject for artist Monte), wander the medieval quarter and visit the site where Joan of Arc met her demise. 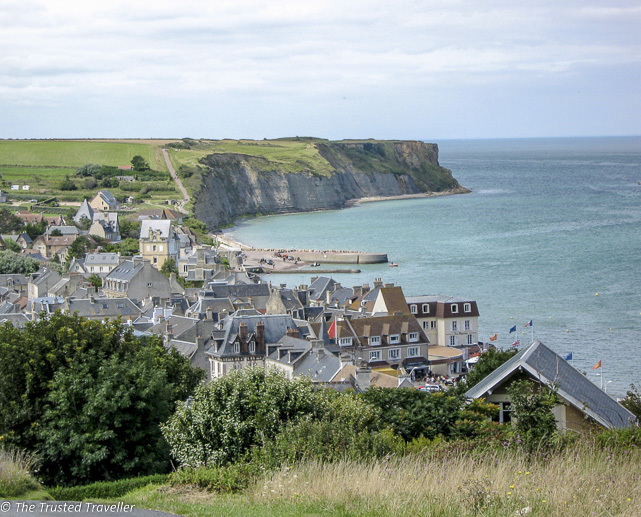 From its dramatic coastal landscape to its rolling green fertile hills and rich history, Normandy is one of France’s hidden gems. Visit to delve deeper into its Norman, Medieval and War Time history; taste the freshness of the regions orchids, seafood and cheese; and explore the dramatic yet charming coastal towns. 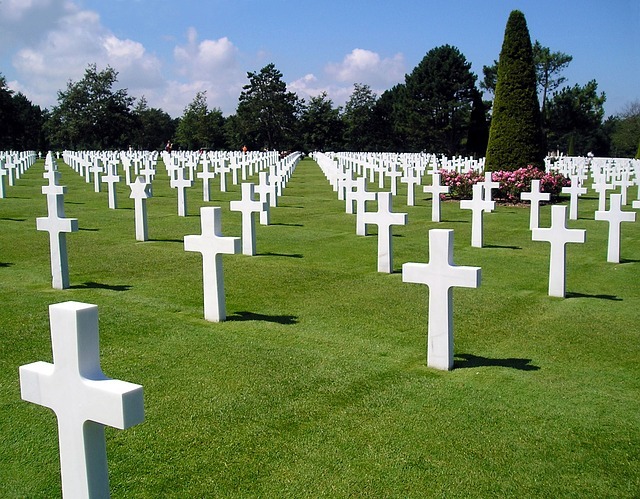 Arromanches – On the 6th of June 1944 during World War II, Allied troops stormed the beaches of Normandy beginning their victory on the Western Front. 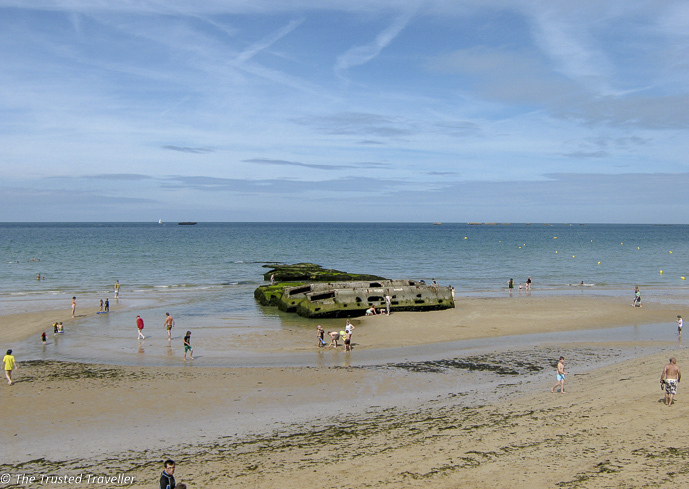 You can visit those beaches, including Arromanches, where you will see remnants of the ‘Mulberry’ harbour the troops built. Then head up to the cliff tops to the 360 Cinema to get just a small feel for what it would have been like for the troops. Bayeux Tapestry – Known to the French as La Tapisserie de la Reine Mathilde, this 230-foot long tapestry is one of the largest and most detailed in the world, and tells the story of the events leading up to the Norman invasion in 1066. While you’re in Bayeux the town itself is also worth a look. Camembert – France’s most famous cheese, Camembert comes from the village of the same name right in the heart of Normandy. You can take a tour to see how it is made and taste this creamy brie-like cheese at the President farm located in the heart of Camembert. 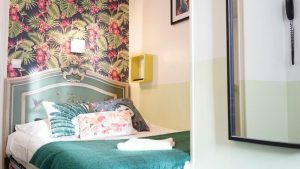 Budget friendly family-run B&B. 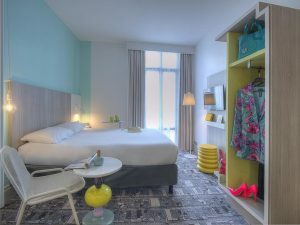 Clean and comfortable rooms, all with private bathroom and free wi-fi. The centre of town is just a few kilometres away. Located on the Orne River, this hotel offers everything you would expect from an Ibis chain hotel. Included is an onsite bar and free wi-fi. All rooms are air-conditioned. Luxury rooms are complimented with onsite spa and a restaurant headed by renowned French chef Ivan Vautier. Expect nothing but the absolute best for your stay at this unique property. Drive: Caen to Tours – approx. 2.5 hours OR 4.5 hours with a detour to Mont St Michel. Leave Caen early to make the most of the day. 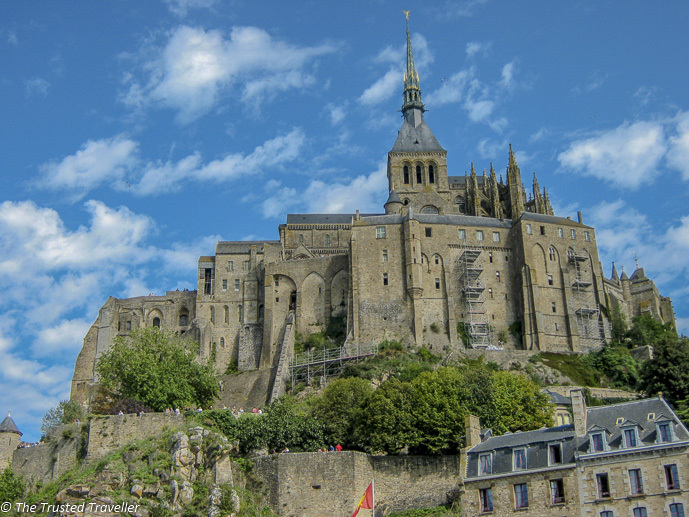 Detour: Mont Saint-Michel – Pictures of Mont Saint-Michel are among some of the most iconic images of France. The town which is topped with a monastery is built on a rocky outcrop in the middle of a tidal flat and connected to the mainland by a causeway. Try to get there early to wander the steep winding streets up to the monastery without the crowds. Famous for its abundance of chateau, The Loire Valley has to be one of the most beautiful regions of France. Explore the chateau, wander the sprawling gardens and orchids, taste the local produce and wine and just simply soak up the beauty of the landscape. 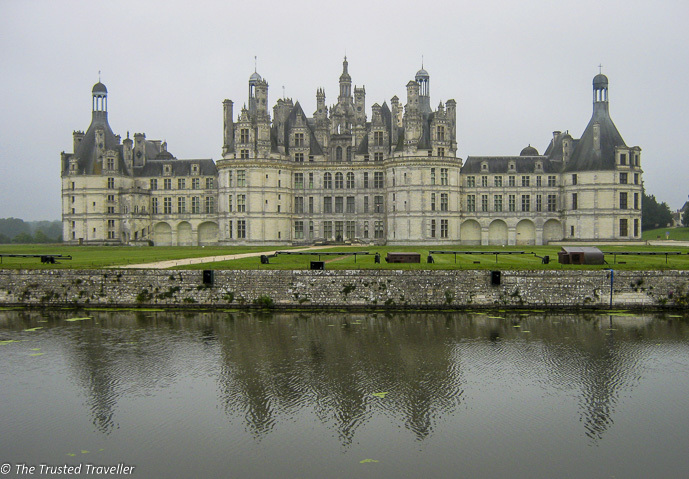 Chateau Chambord – The biggest and most famous of the chateau in The Loire Valley, Chateau Chambord was built by King Francis I as a hunting lodge. Of course it has been upgraded and expanded considerably since then. It is one of the best examples of renaissance architecture in the world. A small number of the 440 odd rooms in the chateau are open to the public to explore. Ainy-le-Vieil Chateau & Gardens – One of the many chateau in the region, what sets Ainy-le-Vieil apart from the rest is the incredible gardens which are split into a series of rooms each with a different theme. The chateau itself has been in the same family since 1467 and you can explore the interiors to check out some of the personal mementos left behind by past family members. 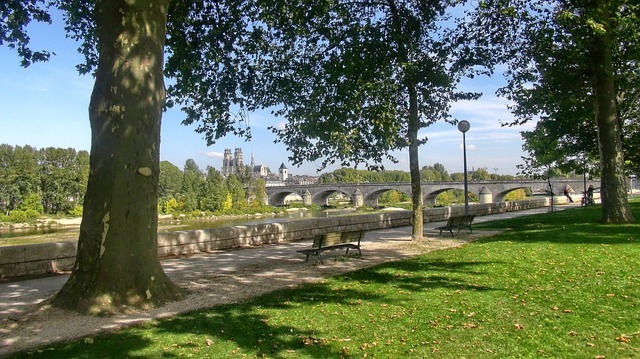 Cycle along the Loire River – The Loire Valley is relatively flat making it the perfect place to hire a bike and take a ride. There are bike hire places in most villages along the river and the path is well sign posted. Whether its just a short ride or a full day, you’ll see plenty of beautiful chateau and have the opportunity to stop by plenty of quaint little villages on your ride. Bourges Cathedral – One of the most remarkable Gothic cathedrals in France, the Bourges is located in the town of the same name and dates back to the 12th century. Modelled on Notre-Dame in Paris, the cathedrals biggest draw card is its spectacular stained glass windows intricately depicting biblical stories. Explore the Vineyards – The Loire Valley has some of the best wine-making soil in France and some of France’s most well-known wine is produced in the region. You can explore the vineyards on your own in the car or hire a bike. Maps are available from local tourist offices making it easy to navigate between the vineyards. Family fun hotel a short drive from the city centre. Free wi-fi and breakfast. Comfortable yet basic rooms all with en-suite bathrooms. A short walk from the centre of the city. This hotel offers comfortable rooms with included breakfast and wi-fi. There is also a fitness centre onsite for the use of guests. This 2.5 hectare property is located right in the centre of Tours. 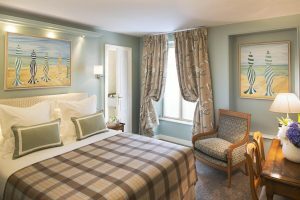 It includes well appointed rooms, onsite swimming pool and restaurant/bar serving delicious French cuisine. Drive: Tours to Lyon – approx. 4.5 hours. Leave Tours early to make the most of the day and allow time for plenty of scenic stops along the way. If the main reasons you’re visiting France are for the culture and the food then you’ll love Lyon. France’s third largest city is home to interesting museums, cultural events year round and food offerings for those with an adventurous palate. 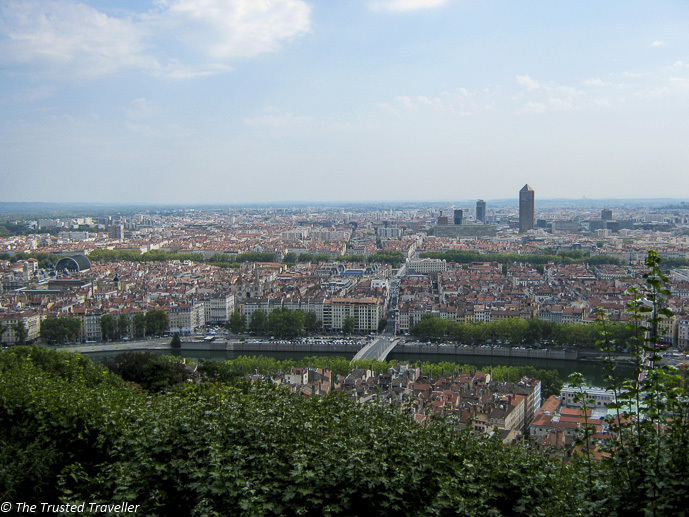 Explore the Vieux – Lyon’s Vieux (old town) is a great place to start your visit. Take a wander around the cobblestone streets through narrow passageways past delicatessens, artisan stores and sidewalk cafes. Keep your eye out for an old traboule which are passageways used in medieval times by the silk industry, some of which have been recently renovated. Dine in a bouchon – These small restaurants serve the most traditional of Lyonnaise cuisine and are best suited to those looking to try something a little different. Dishes on the menu might include ingredients such as tripe, bone marrow or pork offal. Basilique Notre-Dame de Fourviere – Perched high above the old town, this impressive white church dominates Lyon’s skyline and offers great views over Lyon from the promenade out the front. You can walk up the steep steps to get there or take the funicular for a few euros to save your legs. Nicknamed “the upside down elephant” because of its outside shape, inside its interior is quite pretty with lots of ornate features. Roman Amphitheatre – Right next to Notre Dame is one of the best preserved Roman amphitheatres outside of Rome. The theatre holds up to 10,000 people and is used by the city to host many festivals and events throughout the year. When there’s nothing going on, visitors are free to wander around the theatre and picture themselves enjoying a concert in roman times. Museum of Fine Arts – This museum has one of the broadest collections of fine art pieces of any museum in the world with their collection ranging from ancient Egyptian antiquities to modern art pieces from the last few decades. The Museum of Fine Arts also holds pieces that are among the finest in all of Europe. For art lovers, this place is heaven and not to be missed. Hire a bike – Lyon is laid out on relatively flat ground and running right through the city are two rivers. This makes Lyon a great place to hire a bike and explore. There are Velib bike stations all over the city where you can pick up a bike any time of day for a few hours or a full day and explore along the rivers or around the city. It’s a great way to cover a lot of ground in less time. Hop-on-Hop-off Bus Tour – see it all! 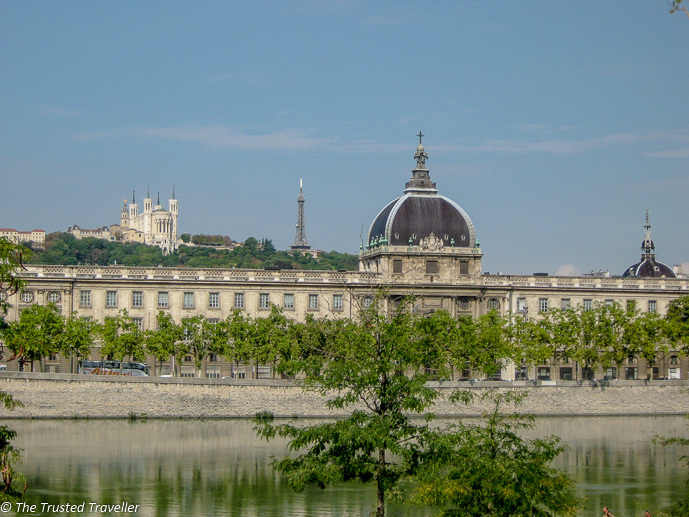 Lyon River Cruise – see the city for the water on this one hour cruise. 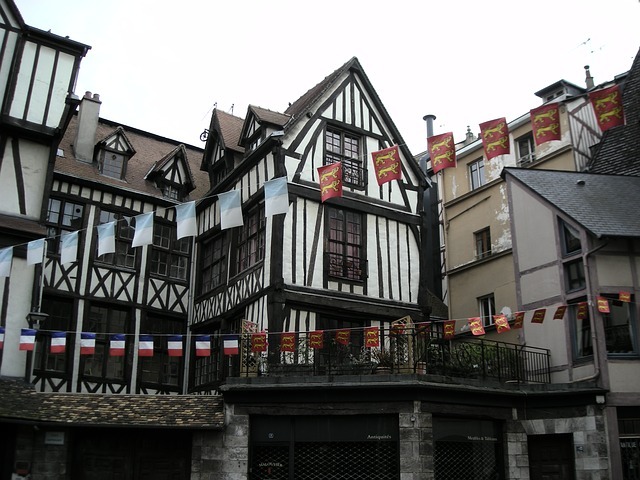 Old Town Food Walking Tour – truly appreciate Lyonnaise cuisine on this stroll through the old town. 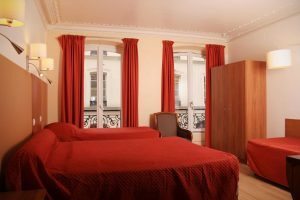 Located just a short walk to all that Lyon offers. Rooms are clean and simple with free wi-fi and private bathrooms. The surrounding area is full of great food and drink options for the evening. Located on the river just outside of the city centre. There is an onsite restaurant and bar with views from the terrace. Free wi-fi is availabile throughout and rooms are comfortable with everything you’d expect. Located on Fourviere Hill with panoramic views over the city. Featuring indoor heated pool and hot tub, private garden and luxury appointed rooms. Walk everywhere! Drive: Lyon to Aix-en-Provence – approx. 3.5 hours. 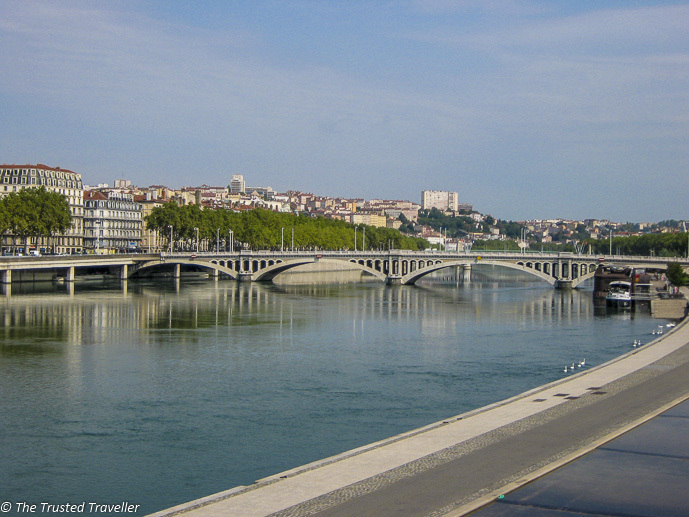 Leave Lyon early to allow time for plenty of stops along the way. Suggested Stops: Allow plenty of time to stop at two French gems. 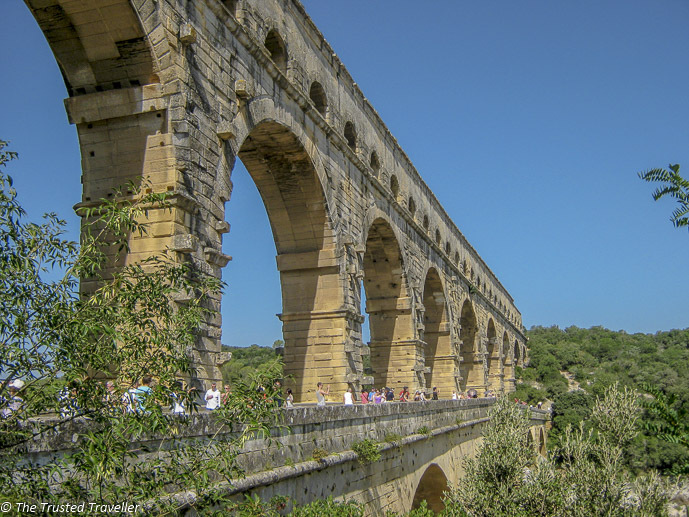 First make stop at the Pont du Gard for a stroll out to this ancient roman aqueduct. Then head into Avignon to check out the Palais des Papes, walk over the Pont Saint-Benezet, wander the cobblestone streets browsing the boutiques and relax in one of the many sidewalk cafes. Food to the people of Provence is everything, so foodies will love exploring this region. 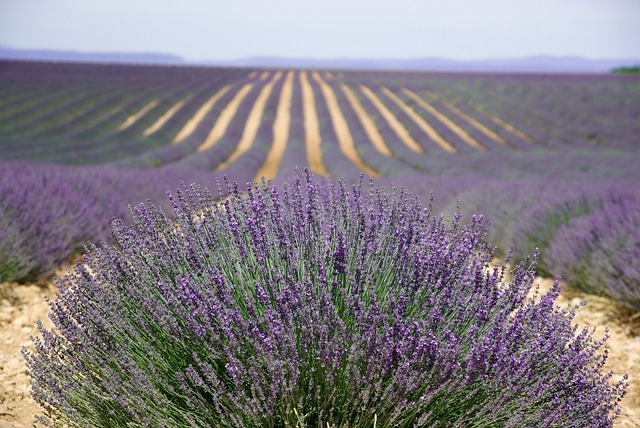 From the markets to the cafes and rolling fields of produce, Provence is a region for the senses. Its naturally beautiful landscapes and pretty little towns have been attracting artists for hundreds of years who come for the light and create masterpieces that can now be found in some of the best galleries all over the world. Aix-en-Provence – Basing yourself in Aix-en-Provence will give you plenty of time to explore this picture perfect town. Dine in one of the many fantastic restaurants that use only the best local produce. Wander the cobblestone lanes to see exactly why artists like Cezanne were so inspired by this town. And browse through the chic boutiques scattered through the town. 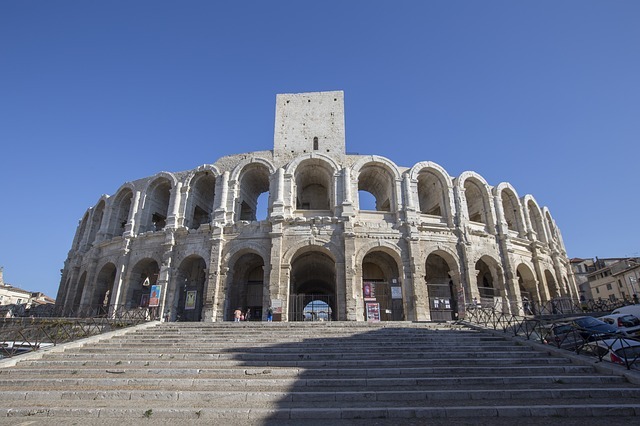 Arles Amphitheatre – During the summer months this ancient roman amphitheatre comes alive with plays and concerts. For the rest of the year it is open to visitors. Take a walk around and picture yourself back in the roman days watching sporting events, wild-animal hunts, executions of prisoners, and gladiatorial contests. 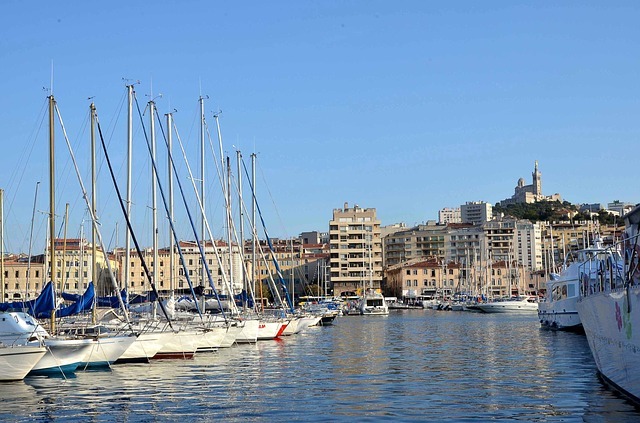 Marseille’s Vieux Port – The Old Port of Marseille is the beating heart of the city and the Provence region. It is the place where locals and visitors go to relax, eat, drink, shop and just generally enjoy life. Wander through the shops and markets, have a drink or a bite to eat in one of the restaurants, bars and cafes or just stroll along the harbour people watching. Saint-Remy-de-Provence – This quaint, traditional Provençal village is rather sleepy these days but back in Roman times it was a thriving Roman settlement, the ruins of which can still be seen today. However, this isn’t the town’s only claim to fame. It was also where Van Gogh was housed while being treated for his many psychiatric problems. It’s a lovely town to explore on foot and enjoy a break at one of the many cafes. Moustiers Sainte-Marie – Hiding up the Gorges du Verdon is the town of Moustiers Sainte-Marie. The drive to this beautiful medieval town is on a long and winding road up the gorge with some spectacular scenery. The village itself is charming and well worth the effort to get there as it seems like time has stood still of hundreds of years. Cosy rooms with air-conditioning, free-wifi and en-suite bathrooms. Breakfast is available on the terrace and there is free parking onsite. Located with easy access to the city centre and motorway for exploring. Located right in the heart of the city centre. The terrace offers panoramic city views where you can enjoy your breakfast. Rooms are comfortable with free wi-fi. Expect world-class service at this stunning villa. Outdoor swimming pool with sun loungers surrounded by a beautiful garden. Rooms are elegant and there is an onsite restaurant and bar. 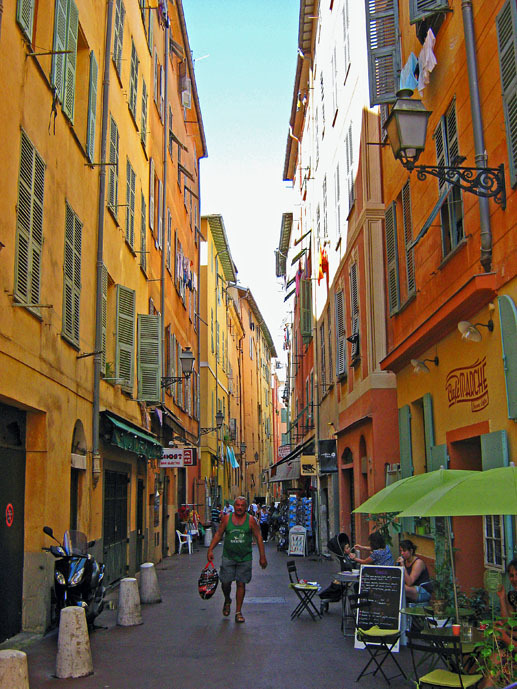 Drive: Aix-en-Provence to Nice – approx. 5 hours if you take the slower coast road the whole way or 3 hours if you take the inland faster route. 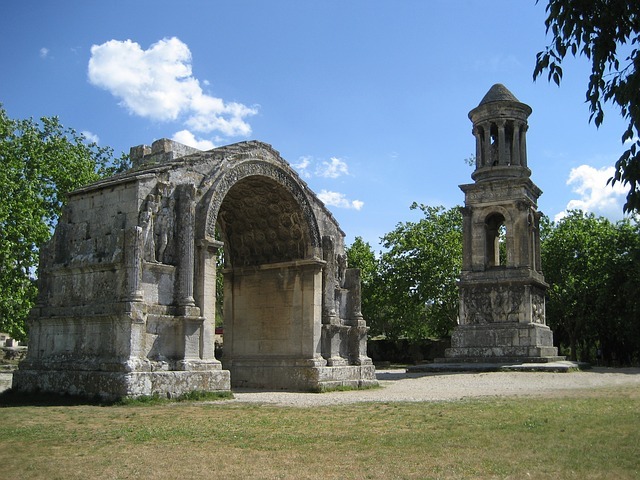 Leave Nimes early to make the most of the day and allow time for plenty of scenic stops along the way. Optional Detour: To get to Nice you can take the quick route shown in the map above. Or if you have a bit more time you can detour the French Riviera coast stopping in Saint Topez, Cannes and Antibes. The heart of the French Riviera, Nice is everything you have heard it is and so much more. Nice is a mixture of grit and opulence drenched with lots of sunshine. While the beaches and corso are the places to be and be seen, it’s the winding cobblestone lanes of the old town you’ll want to get lost in and find your own little piece of Nice. 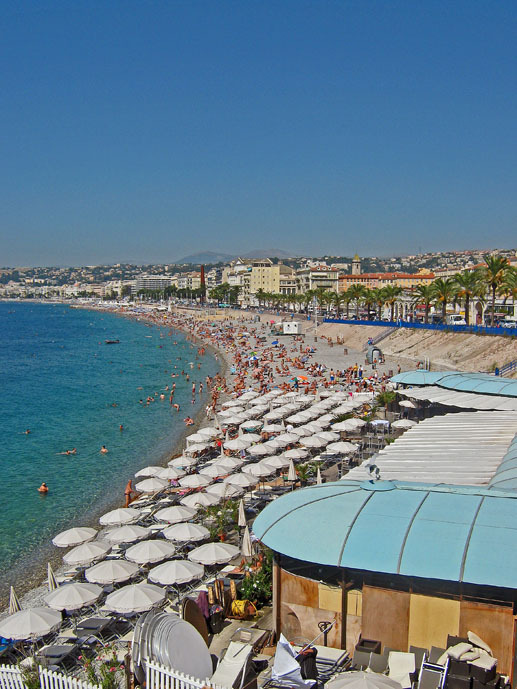 Soak up with sun on the beach – While the beaches of Nice aren’t like the white sandy beaches most will be used to, the warm Mediterranean seas are more than enough to get most people over having to walk on pebbles. Whether you hire a sun lounger and umbrella for a day or brave it on the pebbles, a day by the water in Nice is an absolutely must! Stroll the Promenade des Anglais – This palm fringed promenade runs for five miles along the beach at Nice and is the place to be and be seen when the sun is shining. You could easily spend a few hours strolling up and down the promenade watching the people enjoy life and this beautiful part of the world. Nice Old Town – Once you’ve had your time in the sun, head to the old town to wander around the colourful winding cobblestone lanes. It’s a labyrinth you could easily get lost in passing but tiny local cafes, green grocers and artisan stores. There’s usually a market going on too which gives you a great glimpse into the lives of the locals. 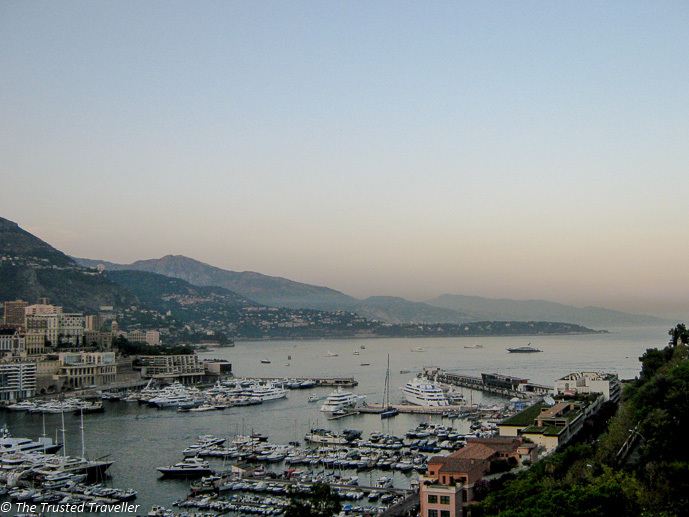 Monaco – The nicest time of day to enjoy Monaco is just before the sun sets. You can take a bus or train from Nice (20-30 minutes) in the late afternoon to explore Le Palais des Princes de Monaco then watch the sun set over the billions of dollar’s worth of yachts in the marina. Finishing off the night in the Monte Carlo Casino or just outside in one of the sidewalk cafes checking out some of the world’s most expensive cars and the wealthy people who own them. Museum of Modern and Contemporary Art – Get your final art fix of the trip at this museum famous for its Pop Art collection. The Museum of Modern and Contemporary Art has a large collection of permanent exhibitions which are free to visit as well as ever-changing temporary exhibitions for a small fee. The building itself is also a work of art and worth a look, as is the view from the roof. If you follow this trip to a tee you’ll be driving close to 2,000 km so you’ll want a vehicle that is comfortable for both driver and passengers, plus on that has plenty of space for your luggage. 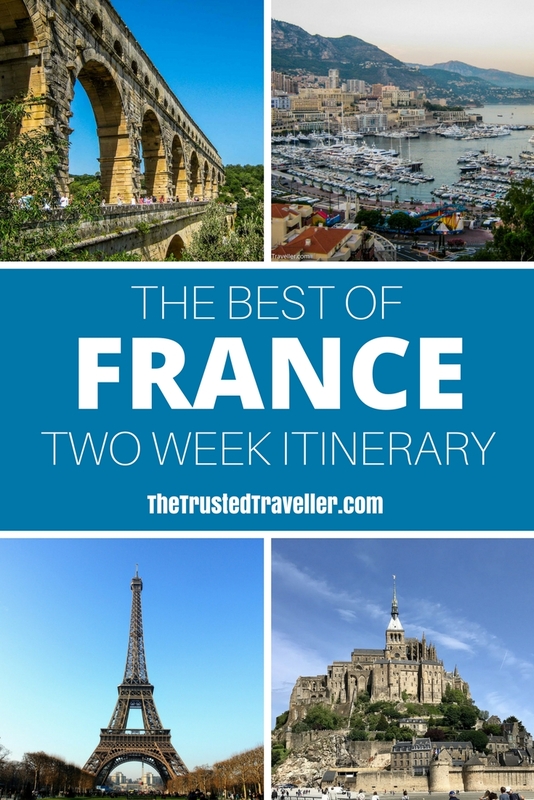 If you have more than two weeks to spend in France you have a few options to extend you’re time there. You can choose to add some additional days at the places mentioned above. This will give you more quality time to spend in each place and will allow you to see more and spend a bit more time relaxing. Alternatively you can add another destination or two to your journey. Just a few of these options include the Bordeaux wine region, the French Alps, Dijon for the cuisine or Strasbourg on the German border to see how the cultures mix together to form a truly unique city. What is your favourite part of France or where are you most keen to visit? This looks like an incredible itinerary! I’ve only been to Paris and for not that long, would love to go back and do it properly! You could absolutely do parts of this itinerary by train. Check out https://www.bahn.com/i/view/index.shtml for timetables. Or send me an email and I can see what I can do. When you end in Monaco, what are the options to get back to the US? Is there an airport so you can fly back to Paris then US? There is an airport in Nice that you can fly direct to the US from depending on the city you are going to. Otherwise you can fly via most major European cities from Nice to the US. I am coming with my wife and 6 year old. We would like to tour the above (possibly shorter in Paris). Outside Paris – 05 Jun (from Paris) to 13 Jun (Nice). Is there any tour groups we can join for this itinerary or it can be done easily on our own ? Any reasonable recommendation for tour organizers for a similar tour ? I don’t know of any tours that run for this short amount of time in France sorry. However, this trip would easily be done on your own if you hire a car. With your shorter amount of time, you would need to skip a few places and spend a few longer driving days. I am unsure about licence validity for India I am afraid. Might be best to speak with your local licence registery to find that one out. A bus could definitely replace this whole itinerary, a train may be more tricky but not impossible. Cycling would be big distances and you would need a lot more time to cover the long distances. Hi Jen, I am planning to do this itinerary this Oct’18 last weekend upto early week of Nov’18. Is this doable? Should I be worried about any Snowfall during the drive? All you need is 2 weeks to do this itinerary. If you have less time, you can remove one or two places to make it more achievable. More time, you can add extra time in some places or some of the other suggested stops at the end. It is flexible. At that time of the year it is unlikely to snow but if it does the areas you are travelling to are well equipped to help you if it does. Thank you for this wonderful article. I have pinned it for when I have more time to visit the southern area. This dec we will be in paris for 5 night and as part of that, I have been trying to find vineyards that we can visit as a day trip or spend a night in town. however, I noticed some vineyards are closed in december time – do you have any experience with that? Thanks Anish for the kind words. I hope you enjoy Paris. I haven’t had any experience visiting Paris at that time of year i’m sorry Maybe you could find a tour that would be able to help you get to the ones that are open. I love your itennery and descriptions! We are coming to France 4June for 7-8 days. We think 2-3 days in Paris then we want to immerse in smaller villages either by car or train. I think its impossible to visit all 4, in 8 days. Which would you suggest we prioritise for this trip and how would you arrange them? We intend to take the train from one city to another. GOod to hear you are getting out of Paris. France is so much more than Paris. If you can squeeze in more than 8 days you will have more time to enjoy this. Otherwise suggest dropping one to give you more time to spend in each place and there is also quite a distance between some of them so you will loose whole days travelling. Suggest dropping Bordeaux only because it is so far south. All the other are up north. Order I’d suggest if you dropped Bordeaux would be Mont Saint Michel, Loire Valley and Strasbourg.